Every Saturday morning at 9:00 a.m. on 1190 AM the cast and crew begin to provide listeners with automotive, news, and entertainment in a fun and exciting way. Listeners are able to interact with the show via social media through Facebook and Twitter. All comments reach the show’s personalities in real-time and many questions or comments are answered on the air. However, that is not the whole story! Jim Proctor who is known to his listeners as Doc approached Josh “The Guru” Deaton and “The Spin Doctor” James Schaefer to put together a unique show that would inform as well as entertain its listeners. Proctor is the General Manager of Dodge City of McKinney which is one of the leading Chrysler, Jeep, Dodge and Ram dealerships in North Texas. He saw a need for today’s automotive consumer and wanted to do a show helping with the buying process of cars, trucks or suv’s. “I love helping customers find the perfect vehicle for them and their family and The ANE Show was a perfect medium for me to give great automotive advice.” States Doc. To put the show together, he looked to one of the Nation’s leading Digital Media Companies. He turned to Josh Deaton and James Schaefer who are Co-Founders of DeliveryMaxx. DeliveryMaxx is an innovative digital marketing company that has developed a patent-pending digital program that blends social media marketing and online reputation management using common sense business principles and today’s technology separating their clients from the competition in a huge way. DeliveryMaxx clients experience an increase in sales, online reputation, and customer satisfaction throughout their business. Both Deaton and Schaefer are personalities on the show and DeliveryMaxx allows The ANE Show’s listeners to interact with the talk radio show. Now, a show just about automotive would only reach a limited amount of an audience. So the Doc, Guru, and Spin Doctor turned to a couple of “Pretty People” well known in the entertainment industry. They reached out to “The Coolest Guy in Dallas” and Actress/Model Jennifer Reed. Both are Co-Host on The Drew Pearson Show and have graced the cover of magazines as well as starred on well-known cable programs. They truly bring the entertainment to the hour-long program interviewing guest such as Matthew McConaughey, Metallica, Ice Cube, Kevin Hart, and Ben Stiller just to name a few. It would be remiss if we didn’t mention Joel “The Gorilla” Nordgaard. He is usually behind the computer screens making sure all of the personalities have their facts straight before they share information on the air. Recently, “The Gorilla” landed famous sports legends like Randy White, Drew Pearson, Tim Brown, and Jen Welter on the show. These interviews were epic in nature bringing a lot of stories never heard before in public. So how is the show like skydiving? It’s simple. The “Doc”, “Guru”, and “Spin Doctor” go on-air without a script. They just start talking about the latest in Automotive, News, and Entertainment. It’s like jumping out of the airplane without checking if your parachute is secured and packed. It’s a lot of fun falling, and you hope you don’t splat all over the ground in the end. So far, these guys have put together a great show that is creating a lot of buzz on the airwaves. You can catch The ANE Show every Saturday morning at 9 a.m. on 1190 AM. If you want to be part of the show follow them on Twitter @TheANEshow or Facebook at https://www.facebook.com/TheANEShow. 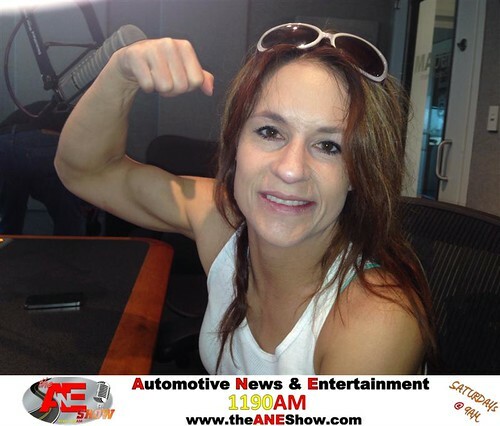 Dr. Jen Welter on The ANE Show, a photo by theaneshow on Flickr. The Spin Doctor and Doc spend some quality time with Dr. Jen Welter at the ANE Show. Jen Welter actually has her PhD while playing professional football. 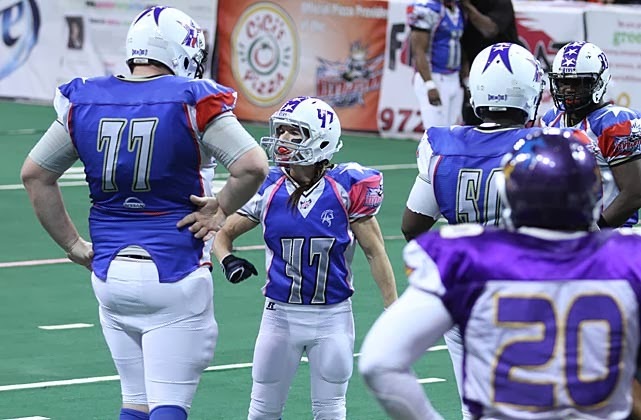 She is 130 lbs., 5'2", 36 year old women playing running back for the Texas Revolution indoor football team. 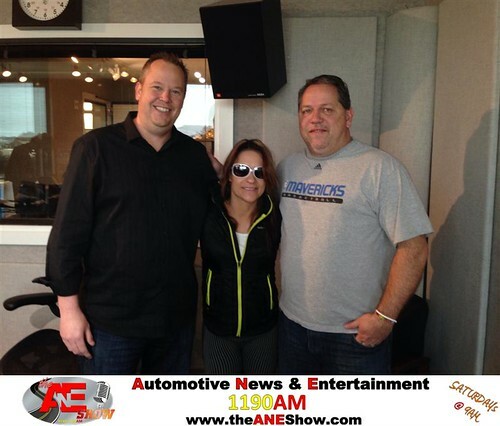 Dr. Jen Welter stole the show on The ANE radio program. She has played 13 years in women's pro football winning 4 National Championships and 2 Gold Medals. She is an 8 time pro-Bowl Linebacker/Safety and currently plays running back for the Texas Revolution Men's Indoor Professional Football team. Jen Welter is one tough player on the football field. However, she is also very smart earning her BS in Marketing at Boston College, Masters in Sports Psychology, and PhD in Psychology from Capella. Dr. Jen Welter has the whole package in her 5'2" frame. 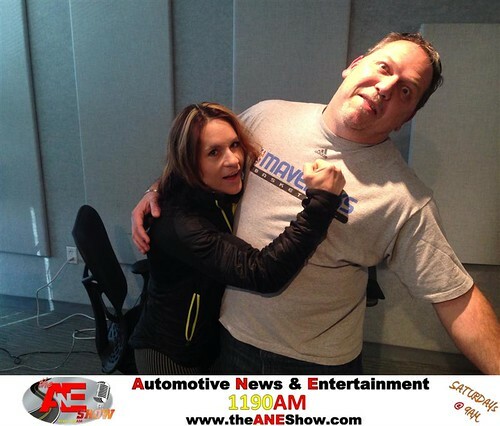 Dr. Jen Welter was a knockout with The ANE Show. This 5'2" beauty commands attention with any audience and has a great story to tell. Every Saturday morning the cast of Jim “Doc” Proctor, “The Guru” Josh Deaton, James “The Spin Doctor” Schaefer, The Coolest Guy in Dallas- Paul Salfen, and the beautiful actress/model Jennifer Reed challenge the traffic of Dallas to entertain listeners nationwide. This is no easy task as Texas is rated one of the top 5 worst states to drive in. People are 65% more likely to be in a collision versus other states in the union. The roads shut down during a rain storm, and summers are brutal. However, this cast of characters care so much for their fans that they brave these terrifying conditions to bring the latest in Automotive, News, and Entertainment. After the hour long show of informative information and interaction with listeners through social media; the on-air radio personalities pack up, head back into the reality of life, record their stories and head back to the station every Saturday morning at 9 AM to please the ears of listeners the next week. Nothing is safe as “The Guru” and “The Spin Doctor” have been known to get into trouble at home for sharing too many family secrets. What would you expect from a guy who boasts about his mullet during his high school days, or one who claims to be the best little league coach in the Dallas area? (Tune in to see which story goes with who). Paul Salfen and Jennifer Reed grace the cover of magazines and can be seen at various times when perusing through the TV channels. Not only do they experience the life of the Rich and Famous; they gossip about it as well. These two will share how “the other people” live. Now, this show would not happen without the Doc keeping everyone in check. Proctor makes sure that each show goes off without a hitch despite the efforts of the cast trying to take the show down treacherous curves. The ANE Show airs every Saturday at 9 AM on KFXR 1190AM. It is a one hour radio talk show with four segments which include automotive, news, celebrity updates, and great information. For more information about the most talked about radio show in Dallas/Ft. Worth visit http://www.theANEShow.com. Jackie Robinson was the first African American to play professional baseball in the Major Leagues. Neal Armstrong was the first man to walk on the moon. George Washington was the first US President elected. Jesse James committed the world’s first train robbery. Theodore Roosevelt was the first American to be awarded the Nobel Peace Prize. Charles Lindbergh was the first man to fly solo across the Atlantic. 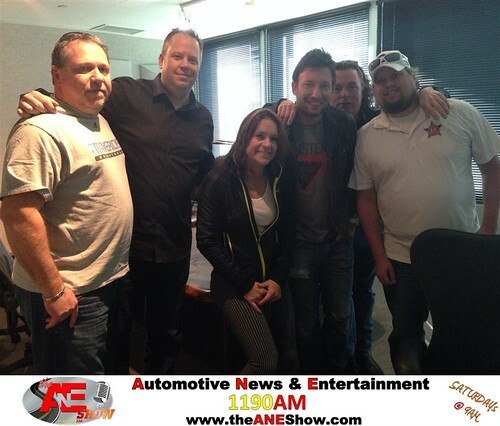 The ANE Show is the first talk radio show to bring automotive, news and entertainment wrapped up into one hour of fun sharing the latest in today’s events. The show also communicates with its audience through twitter, Facebook and other social media channels giving listeners a direct access to the show’s cast of characters. Saturday morning at 9:00 a.m. on 1190 AM; The ANE Show will welcome the first wide receiver to win the Heisman Trophy and the first women to play a “contact” position in men’s professional football. NFL legend Tim Brown who is currently the General Manager of the Texas Revolution and Dr. Jen Reed who recently played running back for the Professional Indoor Football team will be joining Jim “Doc” Proctor, James “The Spin Doctor” Schaefer, Actress/Model Jennifer Reed, the Coolest Guy in Dallas- Paul Salfen, “The Guru” Josh Deaton, Joel The Gorilla and the rest of the crew for a morning conversation. Both of these celebrities have a great story to be told, and listeners will have their questions answered live on the air. Every week the show is real and entertaining. Listeners determine what the show discusses and has immediate access to the radio cast through Facebook, Twitter, and other social media platforms. Jim Proctor is the General Manager for Dodge City of McKinney and brings automotive value while Schaefer and Deaton, Co-Founders of DeliveryMaxx tie the show together with social media insight and customer engagement. Nothing is filtered during the show, and it is designed to provide an hour of fun, entertainment, and relief to the listeners. 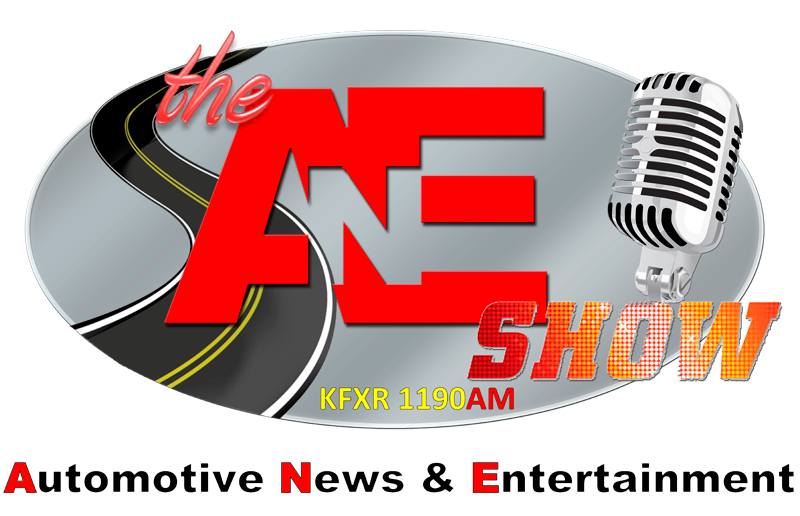 The ANE Show which can be heard every Saturday morning on 1190 AM at 9:00 a.m is known for its “water cooler” style of talking about the latest events in automotive, news, and entertainment. The cast of Jim “Doc” Proctor, Josh “The Guru” Deaton, James “The Spin Doctor” Schaefer, Paul Salfen and Jennifer Reed keep the show entertaining with a limit of filters and a plethora of opinions. Nothing is safe with this crew, but everything is wrapped up in the hour long show giving listeners time to digest the latest in what is happening in today’s news. 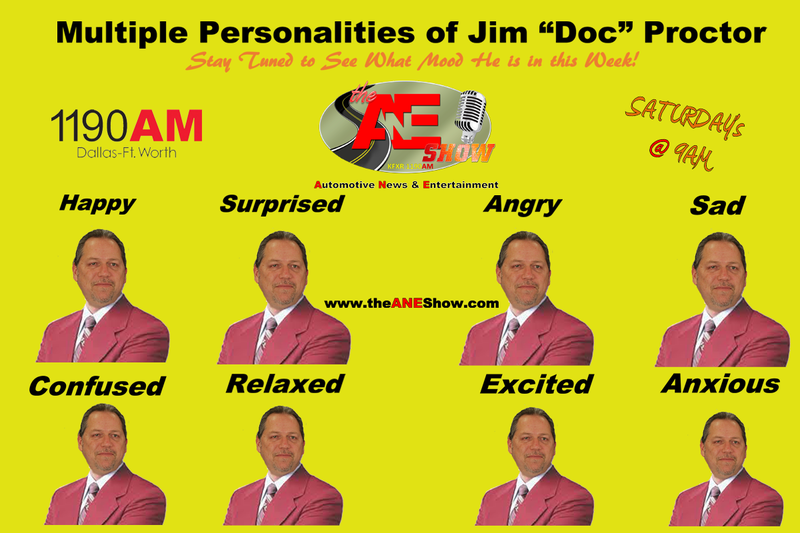 This weekend’s show will be special as “Doc” and “The Spin Doctor” welcome a real Doctor to the show. Not only is Jen Welter the first female professional football player to play a position other than kicker or holder (she plays running back for Texas Revolution men’s Indoor Football League), but she has her BS from Boston College in Marketing, her Masters in Sport Psychology and a PhD in Psychology from Capella. Dr. Jen Welter has always stayed true to her passion for health and fitness. Throughout her 17 year fitness career, Jen has taken certifications with AFAA, Reebok, NESTA, and NASM. Dr. Welter is currently an Expert rated CPT. Football, fitness, and psychology are interwoven in Dr. Welter’s endeavors in speaking, writing, consulting, and mentorship. 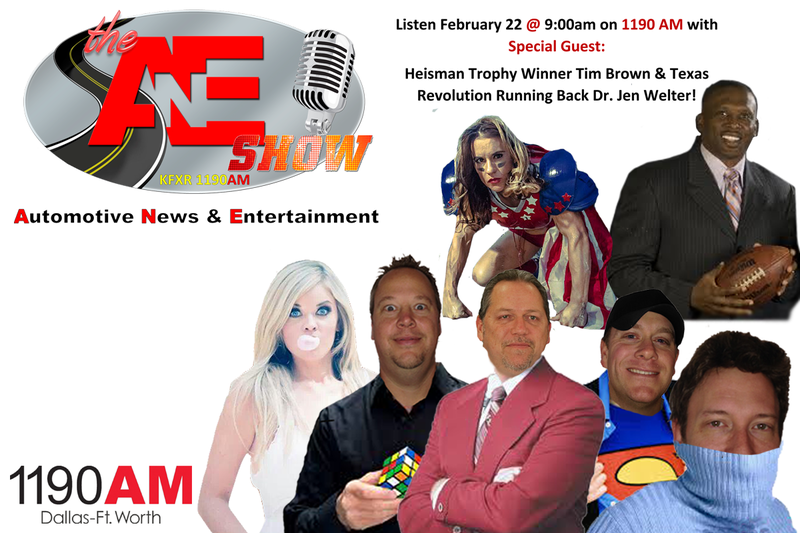 This week’s show will include the first wide receiver to win the Heisman Trophy, Tim Brown and Jen Welter. You definitely don’t want to miss this week’s episode of The ANE Show, so be sure to tune in Saturday morning at 9:00 a.m. on 1190AM KFXR in Dallas or on iHeart Radio! 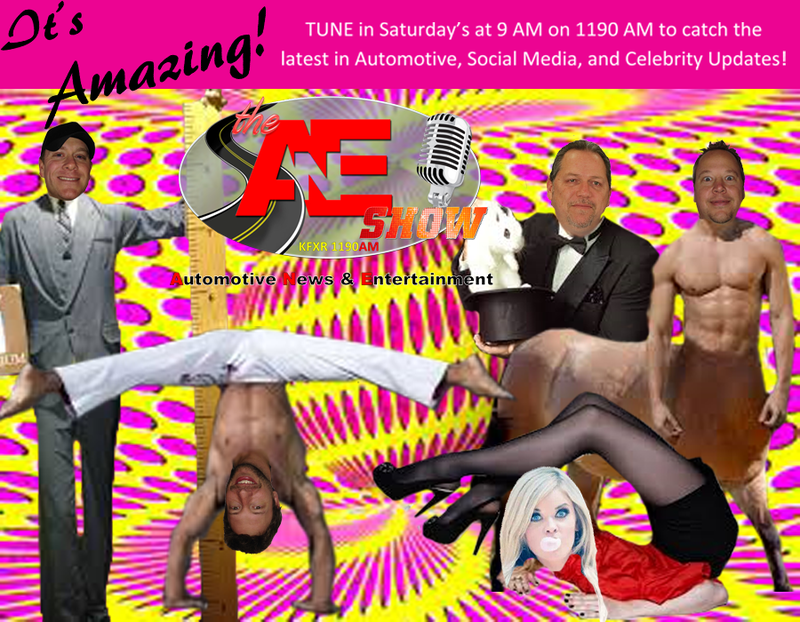 Saturday, February 22nd, 2014 is going to be one amazing special edition of The Automotive News & Entertainment (ANE) Show. 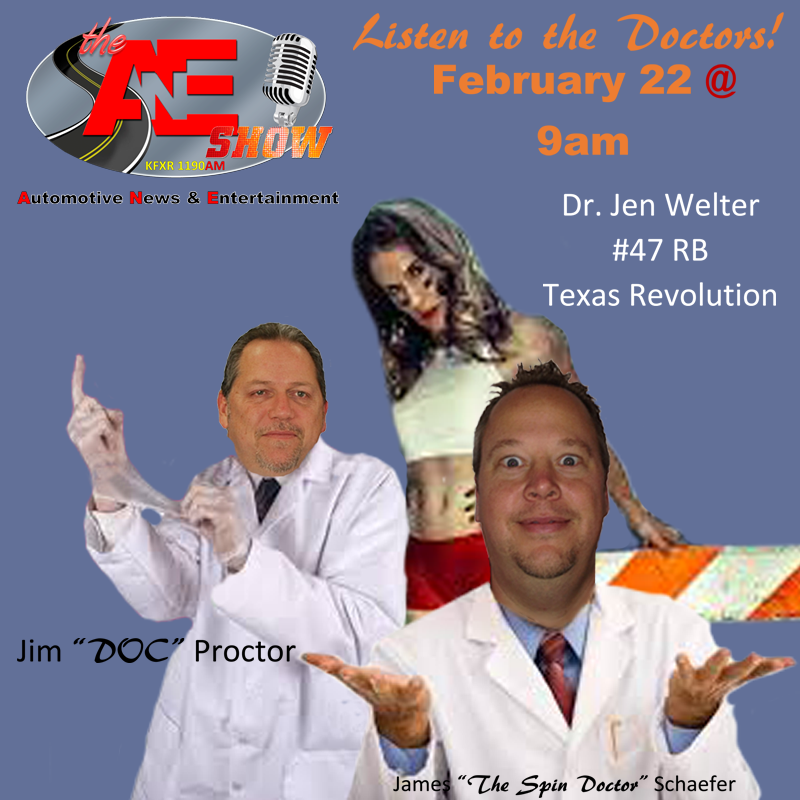 The gang is going to be joined by two very incredible guests, the legendary NFL Wide Receiver Tim Brown and a current Texas Revolution Indoor Football player who is grabbing a lot of headlines, Dr. Jen Welter. Currently Welter is getting goal line carries, but ultimately, Welter is looking to break down barriers and gender stereotypes more than breaking off long runs. “It’s not really about me. It’s about them and the future of the sport.” Said Welter. Jen Welter has an impressive athletic resume, she represented Boston College in rugby all four years and was named the team MVP. She began her career with the Massachusetts Mutiny, an NFL rules, full contact, women’s football team. In her second season, she was named an All-American. After her second season she relocated to Dallas and played for the Dragons for one year before joining the Dallas Diamonds in 2004, where she played 10 years and was named All-American 7 additional times and the team won four World Championships (’04, ’05, ’06, & ’08) and played in the 2013 Championship. Welter signed with the Revolution in January of 2014. She was a gold medal-winning member of Team USA at the International Federation of American Football’s Women’s World Championship in 2010 and 2013. She is arguably the greatest female football player in the world, but she is already on the path to becoming MUCH more than that. There is a great probability that future generations will look back in history and seeing this particular gender barrier coming down, and Jen Welter as the one demolishing it. Throughout her football career she continuously pursued her education and in 2013 not only did she bring home her 2nd Gold Medal, but also her PhD in Psychology, officially becoming Dr. Jen Welter with the publication of her dissertation, The Wonderlic Classic Cognitive Ability Test as a measure of player selection and success for Quarterbacks in the National Football League. She holds her BS from Boston College in Marketing, her Masters in Sport Psychology and PhD in Psychology from Capella. “We couldn’t be more excited to have not one, but two incredible special guests on this week’s show. Between one Legend and another in the making, there will certainly be a lot to talk about and make for an entertaining hour of radio.” Said James “Spin Doctor” Schaefer co-host of The ANE Show. 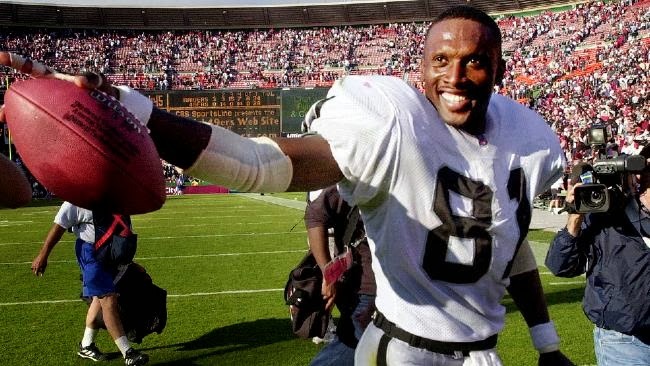 As if Dr. Jen Welter wasn’t enough, The ANE Show decided to double down and go for even more extra doses of “Awesome” and will be joined by former NFL Wide Receiver Tim Brown. 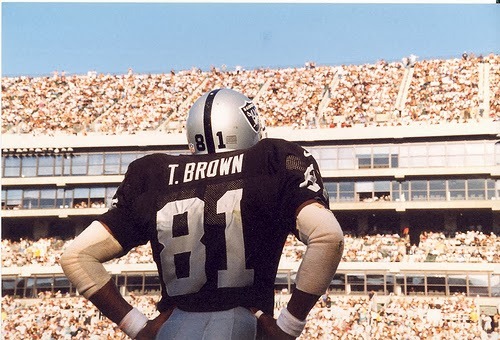 Tim Brown played college football for the University of Notre Dame from 1984-1987, earning the nickname “Touchdown Timmy.” In his first year, he set a freshman record with 28 receptions. As a junior, he set a record with 1,937 all-purpose yards, rushing for 254 yards and 2 touchdowns and catching 45 passes for 910 yards and 5 touchdowns in addition to a slew of kick-off and punt return yardage, becoming the first receiver to ever win the historic Heisman Trophy. Selected by the Raiders with the 6th pick of the 1988 NFL Draft, where he went on to a storied NFL career. He is a 9 time Pro Bowler and named to the 1990s NFL All-Decade Team. He played for the Raiders almost his entire career from 1988-2003 and one season with the Tampa Buccaneers in 2004. He signed a one day contract in 2005 with the Raiders to retire with the team, and the second-highest total yards in NFL history, 14,934. He also caught 1,094 passes (3rd in NFL history) and 100 touchdown catches (Tied for 3rd in NFL history). Currently he is the General Manager and Co-Owner of the Texas Revolution and hosts a weekly sports-talk show on WAOR. He is also currently starting a NASCAR racing team as part of their Drive for Diversity program. You definitely don’t want to miss this week’s episode of The ANE Show, so be sure to tune in Saturday morning at 9:00 a.m. on 1190AM KFXR in Dallas or on iHeart Radio! Saturday morning will be a few cast members light without The Doc (Jim Proctor), Bubba (Jeff Thompson) and Paul Salfen rubbing elbows with the rich and famous as well as touring the world; however, Josh “The Guru” Deaton, “The Spin Doctor” James Schaefer, and beautiful actress/model Jennifer Reed will share the airwaves and carry the popular morning radio talk show this Saturday. During the early days of DeliveryMaxx’s rise to the top as leaders in Social Media and Online Reputation Management; Josh Deaton and James Schaefer would talk about exposing companies who committed fraud posting fake online reviews and scams involving social media. Instead, they created a patent-pending program that has revolutionized the way businesses sell their services or products on the internet. “Social Media’s Guru” Deaton, and James “Spin Doctor” Schaefer, Co-Founders of DeliveryMaxx, will work the show alongside Jennifer Reed. Jennifer is known and respected in the modeling scene, specifically for her classic vintage look. She has graced the runway in NY Fashion Week 2013 and will be returning again in February 2014. She has been featured in publications including Austin Monthly, Austin Lifestyle, ICOSA Magazine as well as Vogue Italia just to name a few. Jennifer is also pictured in a mural in Chef Stephan Pyles new restaurant "Stampede 66" in Dallas. She continues to work hard to inspire others to push for their dreams. The Doc, Bubba, and Paul will be missed, but these three will man the show. However, you should listen because without Doc to keep control; there is no telling what will be discussed. 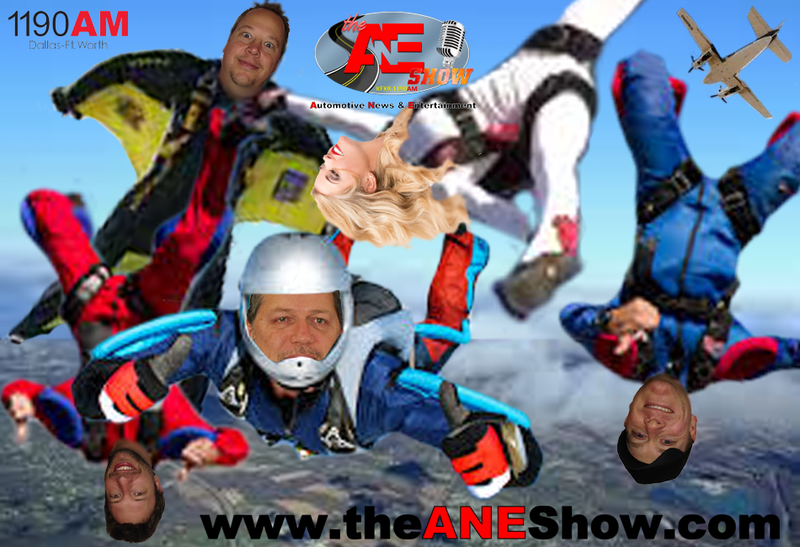 The ANE Show will be a jammed packed hour of fun, entertainment, and information sure to keep you coming back for more. Saturday mornings at 9 AM on 1190 AM just got more interesting for you. For more information about The ANE Show visit http://theaneshow.com or follow on Twitter @TheANEShow. For the latest in celebrity guest or show topics visit The ANE Show’s Facebook page at https://www.facebook.com/TheANEShow. The Automotive News and Entertainment (ANE) Show features a wide cast of colorful characters discussing the latest in car news, sports, and celebrity entertainment. Basically, the talk show is all over the place and conversations often head into odd topics such as Josh “The Guru” Deaton’s cheese toast or Jeff “Bubba” Thompson’s pet donkey. Put it simply, The ANE Show can be chaotic, but in a good way. The show is unscripted, so it is always a surprise where the water-cooler style conversation winds up. Fortunately, the show’s host is there with a harness ready to wrangle in the antics whenever necessary, Jim “The Doc” Proctor has his work cut out for him, but he somehow gets it done. 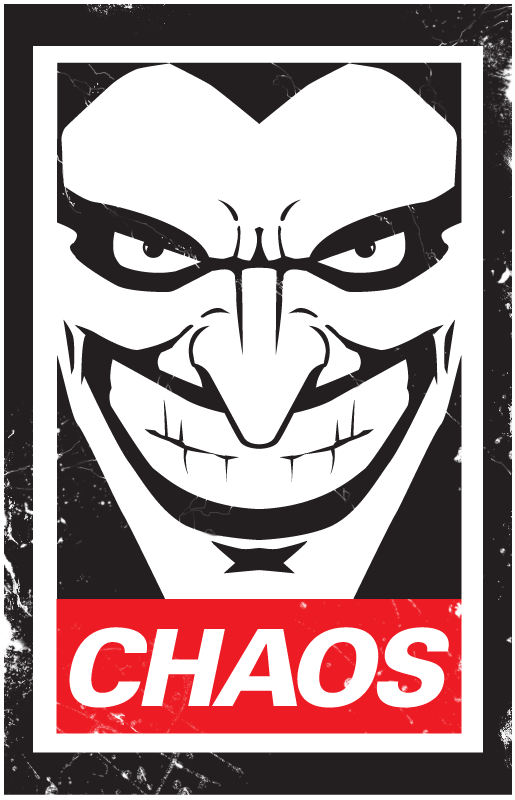 However this week’s show will be hosted by The Guru and some of us fear that the Chaos may rule supreme. What will happen without the infinite wisdom of the Doctor of Cartology holding everyone in check? Only one way to find out, tune in tomorrow, Saturday, February 15th at 9 a.m. on 1190AM KFXR or on iHeart Radio! And be sure to follow the show on Facebook or on Twitter @theANEshow. You can ask the gang questions that could be discussed live on the air! The more distracted they are by user questions the less likely they are to run completely off the rails so submit yours right away! You can also visit their website at http://www.theaneshow.com and be sure to tune in every Saturday morning! The ANE Show is looking forward to spending time with our significant others Friday night celebrating the most romantic time of the year, and we encourage our fans to do the same. However, we want to remind you that most restaurants will be very busy early because listeners don’t want to stay out too late so they will be up early enough to listen to Dallas-Fort Worth’s most exciting talk radio show at 9:00 AM on 1190 AM! Now that being said, be sure to order your flowers, buy your chocolate, rent your movies today so your can revolve your plans around the morning show. Be sure to put the kids to bed early, so you are not up all night celebrating with your significant other too late. You will want to have enough energy on Saturday to participate with Tweets and Facebook comments for the show. If Valentine’s Day were to take place on Sunday; our show would provide you with great ideas and events to plan. Instead, we will keep the entertainment alive and fun since the radio talk show is the day after. Make sure you are not the person who doesn’t do anything for your significant other because the show is more fun when everyone is happy. 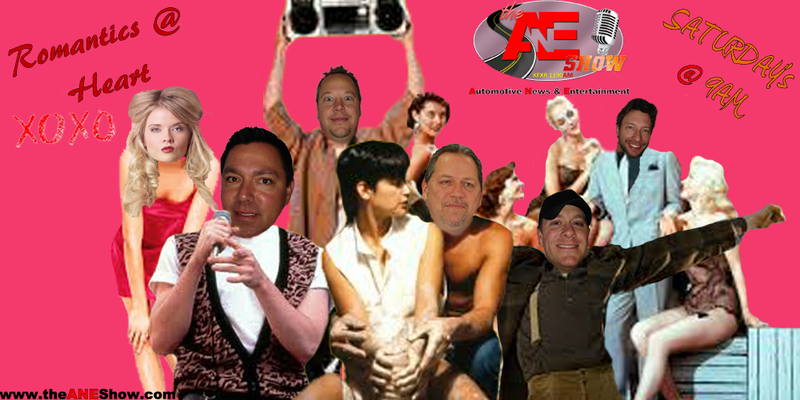 Happy Valentine’s Day from The ANE Show. We hope all of you have a wonderful time, and look forward to spending Saturday morning with you at 9 AM on 1190 AM. 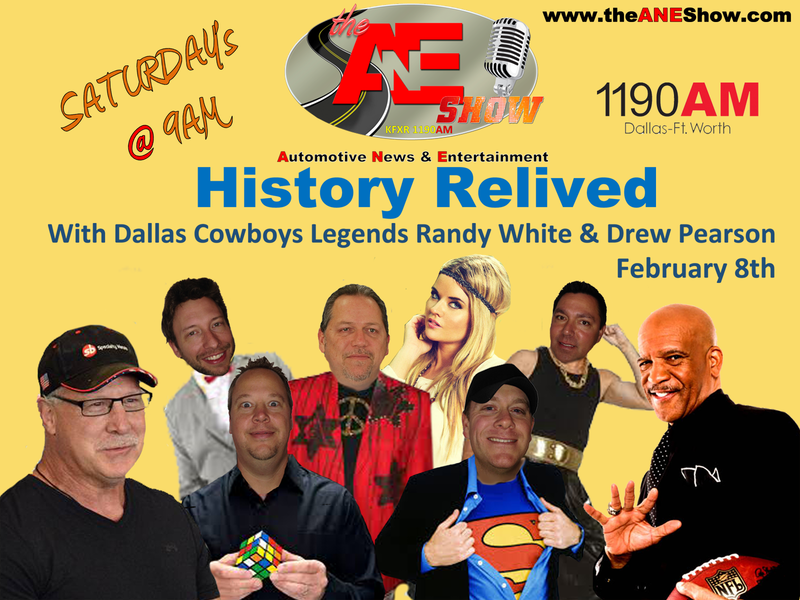 Fresh off of one of their most successful shows with Dallas Cowboys Legends Randy White and Drew Pearson; The ANE Show continues to entertain listeners with “water cooler” talk radio. Listeners feel like they are sitting in the studio or “coffee shop” with The ANE Show radio cast. Dallas Ft. Worth doesn’t mess around when it comes to big games, events and has even Bigger Personalities that love to hear themselves talk. That’s exactly what you get when you have a “Doc”, a “Bubba”, “The Coolest Guy in Dallas”, a “Guru”, a “Gorilla”, a “Spin Doctor”, and a beautiful Actress/Model. You mix this cast of characters up letting them discuss Automotive, News, Sports, and Entertainment and the show becomes a plethora of information and excitement. At the start of the 9 o’clock hour on Saturday mornings; the show becomes a fast pace of twist and turns that every listener can take part in. If this radio show were any longer; it would solve all of the world’s problems. 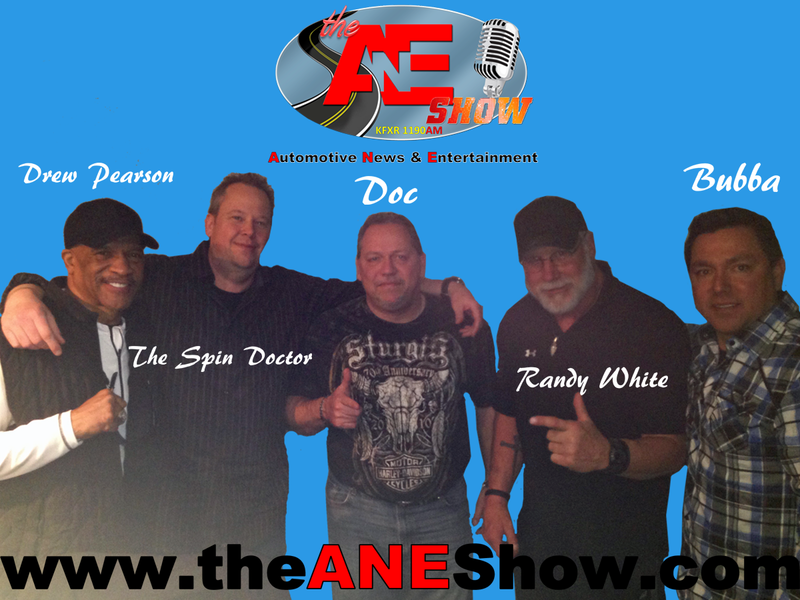 The ANE Show is hosted by Jim “Doc” Proctor who is the General Manager at Dodge City of McKinney. He is joined by “Bubba” who is the Internet Director at the dealership and a consumer advocate. Josh “The Guru” Deaton, and “The Spin Doctor”, James Schaefer of DeliveryMaxx handle Social Media Interactions and up to date news stories. “The Coolest Guy in Dallas”, Paul Salfen and the Beautiful Jennifer Reed introduce listeners to the rich and famous in entertainment. Both Host the Drew Pearson Show, and Jennifer is an Actress/Model. This cast of characters, and we do mean “characters” spend Saturdays providing great information, but they have fun doing it to. There is no telling what will be said on air, because they are real people with real stories. When listeners tune the radio in on 1190 AM they will hear a cast talking about weekly news stories. A few months ago, Jim Proctor and Jeff Thompson of Dodge City of McKinney met up with the Founders of DeliveryMaxx; Josh Deaton and James Schaefer to discuss developing a radio show that provided fun, entertainment, celebrity updates, current news, and important automotive information from a consumer perspective. Thus, The ANE Show was born and has created a strong buzz across the airwaves. 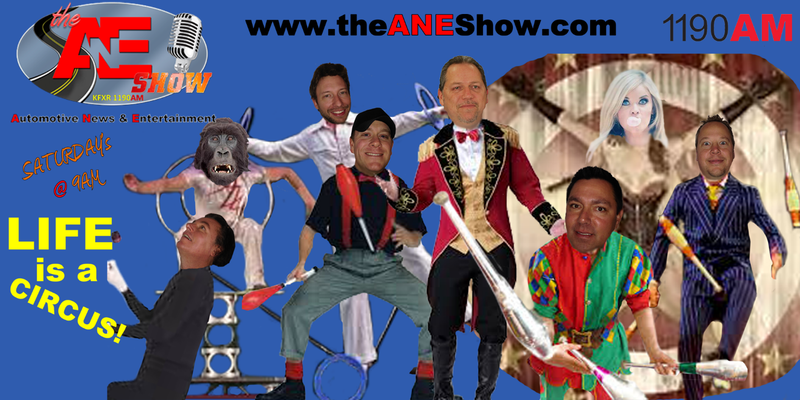 The ANE Show characters have quickly become the Gold Standard in Talk Radio! Both Proctor who goes by “Doc” on the show, and Thompson who is known as “Bubba” have always wanted to provide an Automotive Show that would help consumers with their buying and vehicle maintenance needs. Although there are other automotive shows; their vast experience and knowledge of the demographics of today’s drivers made them realize that the typical automotive show did not provide any entertainment for the listeners. That is when they turned to the boys from DeliveryMaxx. Josh “The Guru” Deaton and “The Spin Doctor” James Schaefer have developed a patent-pending digital program with their company that helps automotive dealerships and other clients engage in “Real Conversations” with consumers and potential buyers. The DeliveryMaxx solution is a one-of-a-kind program that helps companies improve their online reputation and social media presence. By adding DeliveryMaxx to The ANE Show, listeners have become very loyal to the cast and feel like they are in the studio with these guys. With DeliveryMaxx, listeners can communicate with the show by following on Twitter or Facebook. Every question that is asked puts the listener into a drawing for upcoming Dallas Stars or Dallas Mavericks tickets. Knowing that big names attract more listeners; these four guys looked at what they call “The Pretty People” in the industry. Added to the show were “The Coolest Guy in Dallas” Paul Salfen and the beautiful actress/model Jennifer Reed. Listeners get to hear stories from celebrities like Matthew McConaughey, Metallica, Ice Cube, Kevin Hart, and Ben Stiller. All have shared wonderful insights on upcoming movies, and provided listeners with inside information into their personal lives. Last show consist of Hall of Famer and former Defensive Lineman of the Dallas Cowboys Randy White and The Original #88, Drew Pearson. The show was a hit from the start, but what would you expect from two of the most beloved Dallas Cowboys of All-Time? The ANE Show airs every Saturday at 9 AM on KFXR 1190AM. It is a one hour radio talk show with four segments which include automotive, news, celebrity updates, and great information. For more information about the most talked about radio show in Dallas visit http://www.theANEShow.com. Well the NFL Season has officially come to an end after the thrilling conclusion of Super Bowl XLVIII. For those who missed it, the game was a real nail-biter and came down to the very last play as the Seattle Seahawks narrowly defeated the Denver Broncos 43-8. 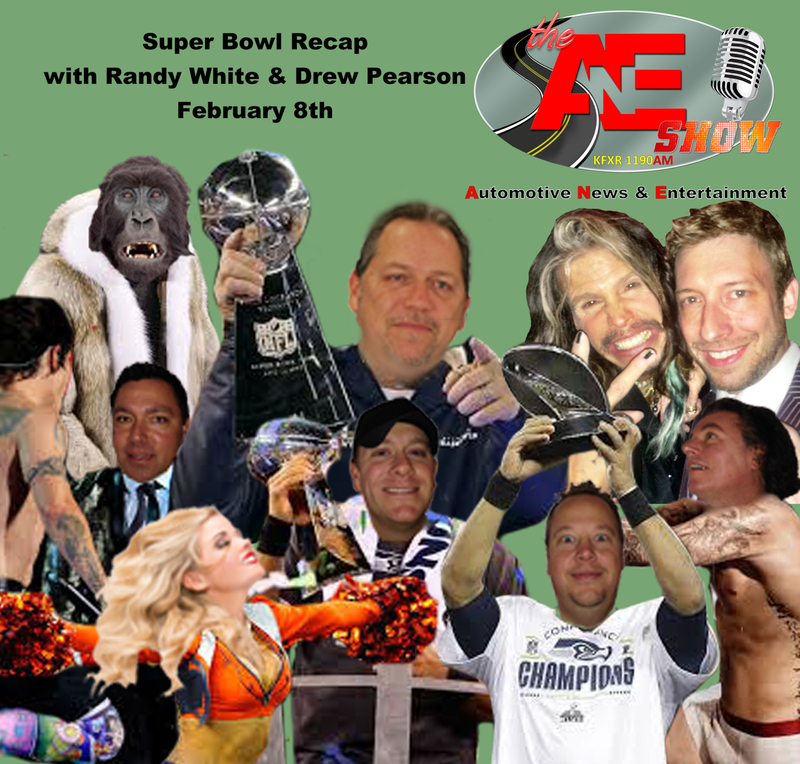 In honor of the NFL season, The Automotive News and Entertainment (ANE) Show will be joined with a couple of very special guests who know a great deal about life in the NFL, guest starring on the show will be a pair of former Dallas Cowboys, Hall of Fame Linebacker Randy White and The Original #88 Drew Pearson! The show will air live Saturday, February 8th at 9:00 a.m. on 1190AM KFXR and iHeart Radio, you don’t want to miss this one! Randy White is often dubbed as “The Manster” meaning half man, half monster, and he certainly lives up to the nickname. As a Dallas Cowboy he racked up over 1,100 tackles, 9 Pro Bowl selections, 9 First-Team All-Pro selections, 3-NFC Championships, and was Co-MVP of Super Bowl XII in 1978 (another Broncos defeat). Drew Pearson is also known as “Mr. Clutch” for his numerous game-winning catches, most notably “The Hail Mary” reception from Roger Staubach that sealed the victory in a 1975 playoff game, one of the most famous plays in NFL history. He also caught the game-sealing touchdown in 1973 playoff game against the L.A. Rams and the game-winning touchdown pass in the 1974 Thanksgiving Day game against the Redskins. Mr. Pearson also has a Super Bowl Championship, the very same year as Randy “Manster” White. These two Cowboys Legends know what it’s like to see the Broncos lose the big game and will certainly have a lot to talk about during the Super Bowl edition of The ANE Show. They even forced more turnovers and allowed fewer completions than the Seahawks did in last Sunday’s game. Whatever you do, don’t fumble the snap and miss this episode, tune in and join Jim “Doc” Proctor (General Manager of Dodge City of McKinney,) Jeff “Bubba” Thompson, Josh “The Guru” Deaton, James “The Spin Doctor” Schaefer, Paul “The Coolest Guy in Dallas” Salfen, and the beautiful Jennifer Reed also discuss today’s news and entertainment. The “Doc” and “Bubba” have spent many years in the automotive industry helping put car buyers in the right vehicle. They are known for providing great vehicles for fair prices, and even more for going the extra mile to make buyers happy. “The Guru” and “Spin Doctor” created a patent-pending digital marketing company (DeliveryMaxx) that blends social media and online reputation to help any company, organization, or person that utilizes the web to share or sell their products or services. To keep the show light and entertaining, Paul Salfen (best known for hosting the Drew Pearson Show) and actress/model Jennifer Reed talk about there every day encounters with radio, TV, and movie stars. When Jim “Doc” Proctor enters the Clear Channel Studios located in Dallas, Texas for the weekly ANE Show on 1190 AM, he is challenged to keep the cast in line and on topic. What else would you expect from a team made up of a “Bubba”, “Gorrila”, “Guru”, “The Coolest Guy in Dallas”, “Spin Doctor”, and a beautiful Actress/Model? This cast of characters has shared crazy stories about driving through border patrol, tricking waitresses into giving them free cheese toast, waking up next to a roast beef sandwich, wearing mullets, and unbelievable adventures. When the “Doc” is in the studio; he is able to keep most of the show focused on Automotive, News, Sports, and Entertainment but given the chance the cast loves to have a lot of fun. It is a three ring circus when these guys take the mic. However, it is always fun and entertaining. Jeff “Bubba” Thompson, the ANE Show’s Co-Host, also serves as Jim’s right hand man in the dealership. He will share “war stories” and other helpful information for the consumer’s automotive needs. Josh “Social Media’s Guru” Deaton, and James “Spin Doctor” Schaefer , Co-Founders of DeliveryMaxx, are experts when it comes to today’s technology and will provide insight to everything pertaining to social media, internet marketing, online reputation, and digital solutions. Paul Salfen, the coolest guy in Dallas, and Jennifer Reed will add celebrity insight with interviews of the hottest stars in sports, music, and entertainment. 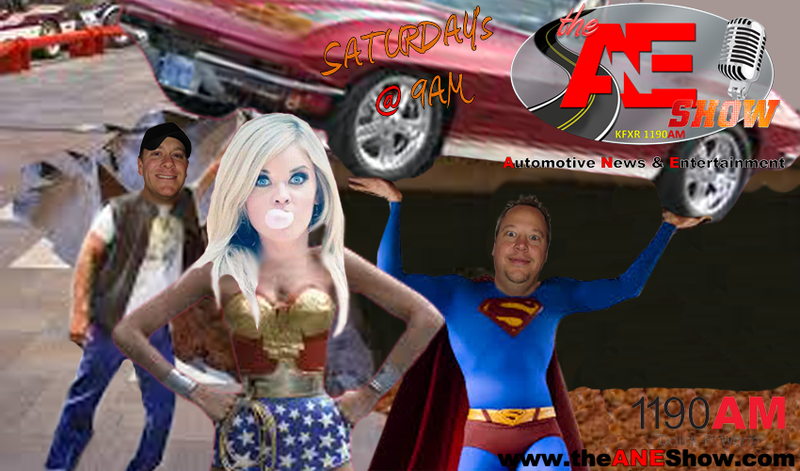 The ANE Show airs at 9 AM every Saturday morning and consist of four segments including two segments of Automotive and News. Proctor and Thompson Host the show starting out with automotive news and giving helpful information such as buying vehicles, financing, selling vehicles, and automotive comparisons just to name a few. Salfen follows with interviews of today’s most popular stars like Mathew McConaughey, Joseph Gordon Levitt, Ice Cube, Ben Stiller, and many more. Visit The ANE Show's profile on Pinterest. KFXR 1190 AM, has added what is touted to be a fun exciting show which will share much needed advice on purchasing and servicing automotive, today’s news, social media topics, and celebrity interviews. The ANE Show will air at 9 AM Saturday mornings and consist of all four segments including two segments of Automotive, News, and Entertainment. Grab your cup of Joe because Saturday mornings at 9 AM on 1190AM just got more interesting. 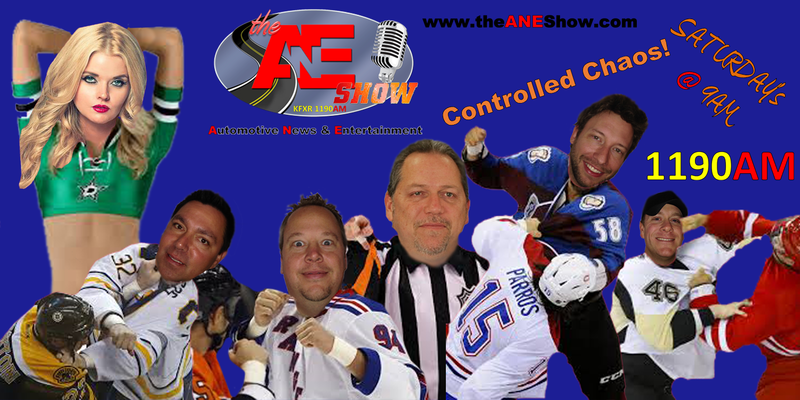 The ANE Show will be a jammed packed hour of fun, entertainment, and information sure to keep you coming back for more.